Just because I’m smiling doesn’t mean I’m not crying on the inside. Just because I’m smiling doesn’t mean everything is ok. But just because I’m hurting on the inside doesn’t mean that I should walk around with my head held low and tears in my eyes. Wearing a smile means a great deal to people, especially when things aren’t going so well. 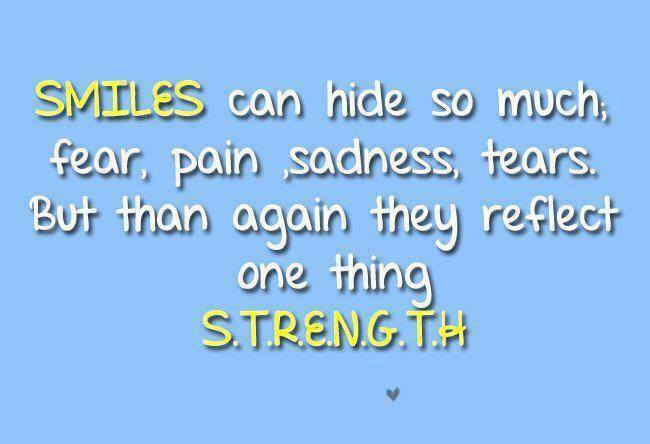 A smile can hide all the bad that is going on underneath, but it also can show the world that the bad hasn’t won. When you smile you show you’re still in the game…you’re still here and you haven’t been beaten. It shows your strength, your dignity, your pride. A smile makes you feel good if just for a moment and that feeling may be exactly what you need to get through the day. To have people look at you like your ok, like they don’t pity you or your situation….trust me that means a lot.